Following its weekly release schedule, Apple's latest beta build 13D61 asks testers to continue to focus on graphics drivers, audio, Safari, Mail and Contacts & Calendar syncing over USB in iTunes. The areas of interest are identical to last week's OS X 10.9.3 Mavericks beta build 13D55. The most recent build comes two weeks after Apple decided to open up the beta testing process to all Mac users via the Beta Seed Program, a major change to its operating policies. It is unclear how the new program has affected beta rollouts. Past betas of the forthcoming OS X Mavericks 10.9.3 supplemental update introduced support for scaling that doubles pixels for 4K monitor output, hinting at a so-called "Retina" output mode for late-2013 MacBook Pro with Retina display. With the latest Mavericks software, Apple is thought to be nearing the final stages of testing before a public release. As for Safari, Apple has seemingly included minor modifications to OS X compatibility born from changes made through the ongoing 10.9.3 testing process. 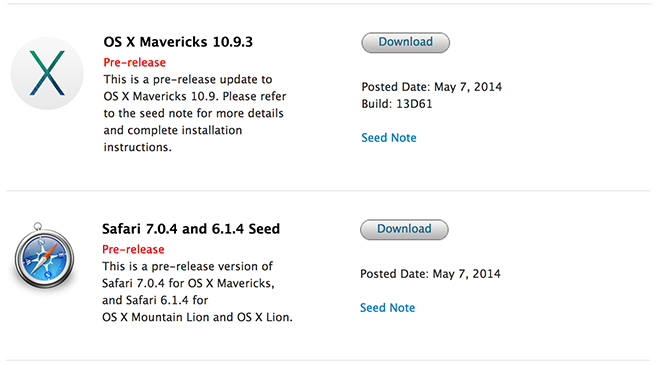 Developers —and users signed up for the Beta Seed Program —can download Mavericks beta build 13D61 and accompanying Safari 7.0.4 Seed 1 from Apple's Developer Portal or via Software Update.